When your story is all about customer skepticism, then prospective customers do not do business with you. Because, for starters, they compare stories with your former customers. If you want to perpetuate customer skepticism, instead of customer confidence and repeat business, here are two sure-fire ways to achieve this outcome. If you want to change your story, and your customers’ experiences, contact me. Let’s start a conversation . Let’s start a new story for your company. For starters, when your story is about disconnected employees fueling customer skepticism, customer confidence erodes. When businesses exclude and marginalize employees, they become experts at fueling customer skepticism. In these “do the job you were hired to do” business models, employees in one function or one department are discouraged from communicating with colleagues outside of their departmental silos. As a result, employees across the organization never really discover who “their people” are. The folks with answers to questions like: why do shipments get stuck in the pipeline? Or, why are clients double-invoiced? Because, as your prospective customer, I am skeptical about doing business with you. Because your former customers are talking about you. And, I do not want to become another casualty of your current story. Then, when your story features non-diverse meetings with non-diverse teams, customer skepticism grows. Consider whether meetings feature a cast of employees from homogeneous (e.g., the same, non-hybrid, non-diverse) pay grades and job titles. This story is the classic “birds of a feather flock together” story. What is the story behind the story, here? Hierarchical exclusivity creates team-based lack of diversity. Intentionally, or not, this cultural model has a devastating impact on employee and customer experience, as well as customer retention. As a prospective customer, I already anticipate the story of how your functional silos and hierarchical mindset are going to play out. Why should I do business with you, when I anticipate the inevitable outcome to our story? 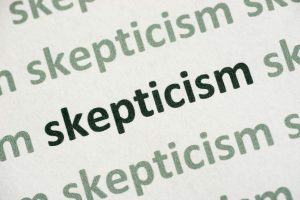 Wrestling with customer skepticism syndrome? Discover how to create and tell your stories, together, with your employees and stakeholders. Tell the stories which make a big impact, and a big difference, on employee experience and customer success? Planning your next corporate or association meeting? Engage me to present one of my Storytelling for STEM Professionals and Left Brain Thinkers speaking programs. Contact me. Babette Ten Haken‘s One Millimeter Mindset™ Storytelling for STEM Professionals and Left Brain Thinkers speaking programs are created for organizations and associations who want to catalyze stakeholder success and customer retention. There is no better way than storytelling to bridge communication disconnects between professional disciplines, paygrades, age groups and levels of education. Babette’s programs are forged from her own background leading teams simultaneously requiring left-brain mindset for clinical research and e-commerce, as well as right-brain thinking for new product development, market research and sales. Find out more right here. Babette is a member of SME, ASQ, SHRM and the National Speakers Association. Her playbook of communication hacks, Do YOU Mean Business? is available on Amazon.com. Babette’s speaker profile is on the espeakers platform. Contact her here.